Description: First published in 1989, this book contained the first systematic account of magnetoresistance in metals, the study of which has provided solid-state physicists with much valuable information about electron motion in metals. The electrical resistance of a metal is usually changed when a magnetic field is applied to it; at low temperatures the change may be very large indeed and when magnetic breakdown is involved, very complex. Every metal behaves differently, and the effect is highly dependent on the direction of the field relative to the crystal axes. 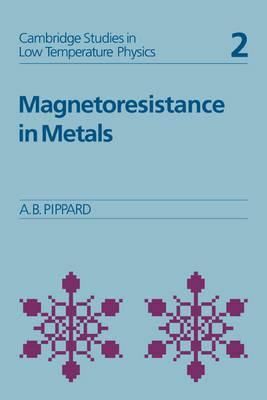 Quite apart from its usefulness for determining the Ferni surfaces of individual metals, the phenomenon presents many interesting problems in its own right; it is the phenomenon, rather than its applications, that Professor Pippard concentrates on in this book. The level of treatment is aimed at readers with a basic knowledge of undergraduate solid-state physics, and makes no great demand on mathematical ability. The text is copiously illustrated with real experimental results.